Clément Sordet recorded the lowest round of his European Tour career and matched the lowest opening round of the season with a stunning 62 to take the lead after round one of the Nordea Masters in Gothenburg. 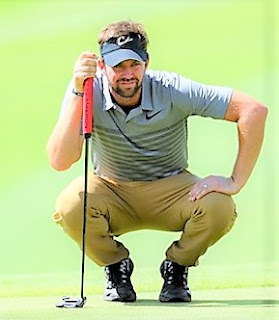 The Frenchman's bogey-free eight under par round was two shots better than the 64 he fired en route to his only European Tour top ten at the season-opening UBS Hong Kong Open, and beat the 63 he shot as an amateur at the 2014 Le Vaudreuil Golf Challenge on the Challenge Tour. It was also four shots better than the course record at Hills Golf Club, but with preferred lies in force this week he won’t take his place in the history books. The four-time winner on the Challenge Tour holds a two-shot lead over Scotland's Scott Jamieson (pictured) and Englishman Lee Slattery, who both signed for six under par rounds of 64. Sordet, who is in his rookie season on the European Tour, got off to the perfect start with four birdies in his first four holes, and he added further gains at the 11th, 12th and 13th holes to get to seven under and hold a two-shot lead. Jamieson briefly joined him at the top of the leaderboard but fell back and when Sordet got up and down on the 18th hole, his two-shot cushion was restored. Finland’s Tapio Pulkkanen and Stewart Hunter of the United States also recorded bogey free rounds to sit at five under par alongside the highest placed Swede Christofer Blomstrand and Australian Richard Green. Belgium’s Thomas Detry, Dane Søren Kjeldsen and Englishman Paul Waring are amongst a group of eight players one shot further back at four under par. Two-time Major winner Martin Kaymer of Germany and European Ryder Cup Vice-Captain and home favourite Robert Karlsson are two of 13 players at three under par. Despite a one over par round of 71, it was a memorable day for five-time European Tour winner David Howell of England, who made his 600th European Tour appearance. Clément Sordet: “I played really well. I've not been playing great the past few weeks so it feels really good to start with an eight under this week. The game feels really nice and I'm really looking forward to this week. “I hit some really good shots. I birdied the first and then I hit it close on the next three holes, so that helps. I wasn't really focusing on the score, I was just enjoying it. Scott Jamieson: “It was great, 64 sounds better than six under so I like the sound of that. “On seven I never thought it was going in the water. Five was the one I got lucky on, I caught a gust and came up a little short but it held the bank, it didn't go in the water. Seven has been playing really tough so a five on that hole is not too bad today. Lee Slattery: “I missed a six-foot eagle putt on the last there, but to be honest today could have been anything. I missed a three-footer on the ninth and I holed a few putts too but I seriously thought I could have gone really low today. I'm still very happy with 64. 65 C Blomstrand (Swe), R Green (Austria), H Stewart (USA), T Pulkkanen (Finland). 66 S Kjeldsen (Denmark), P Waring (Eng), M Pavon (Fra), D Brooks (Eng), S Heisele (Ger), T Detry (Belgium), L Herbert (Australia), T Aiken (SAf). 78 D List (Australia), G Adell (Swe), R Kakko (Finland).